The sky is a bit brighter today. So far no sun. It rained all day yesterday, as it had for days. A soft and soundless rain. I took some pics of my dining room set. It’s hard to get photos straight on because of the size of the room. But I got pics from different angles. I have been acquiring the canvas paintings you see on the wall for months. I found the middle floral painting at Tuesday Morning. At different times, I found the two barn paintings at Wayfair. I was waiting to show the paintings until I either painted the table or got a new one. So they’ve been hanging on the wall since before my first eye surgery. When Ivy came home with us, it made more sense to move the $10 table to the bedroom. This way I have a place to put her and her food when my daughter and Andrew and I are eating in the dining space. If I can break her of jumping on it I won’t have to do that. I have a rolled up stiff piece of paper and when she jumps up there, I smack it against the table (not her of course) and it scares her and she runs. Hopefully over time this will break her of jumping on the table. I am pleased with my decision on choosing this dining room set. The fact that it’s light in color helps to balance the dark living room furniture that is just down the wall from the dining space. 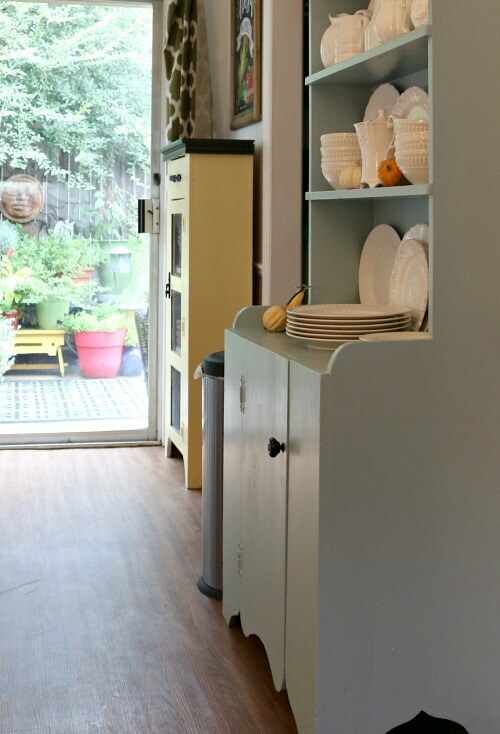 I’m still debating whether to paint the little yellow pantry cupboard blue. I just don’t know if I could get much done with Ivy, unless I shut her in the bedroom. I sure don’t want an Ivy escapade where she jumps into paint! Speaking of Ivy, I have decided on her middle name. It just popped into my head Friday night. She is Ivy Lou. Here is a pic I took last night. 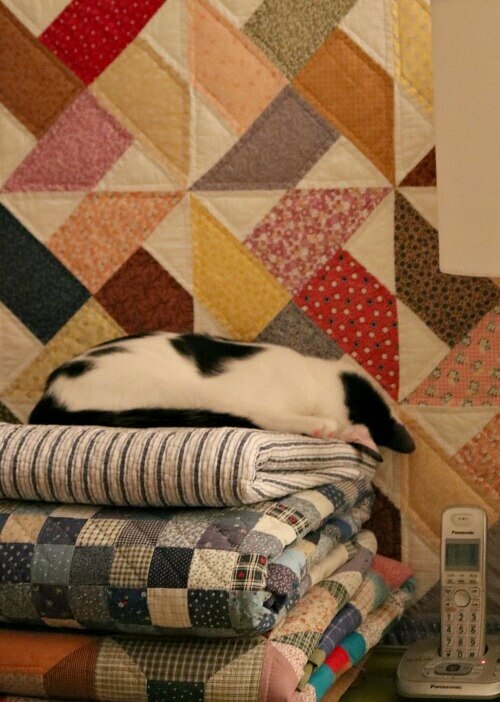 She has her face down in the quilts or maybe the crack between the quilts and wall. I couldn’t tell which. When I head back to the bedroom in the evening, Charlie climbs the doggy steps to lay on the end of the bed. And Ivy heads straight for this stack of quilts. If you want to see a seasonal Halloween kitty cat, take a look at this photo I captured of her this morning. I laugh at this photo every time I look at it. She looks like a spooked cat. I have no idea what she’s reacting to. She goes from calm kitty cat to the other extreme in a heartbeat. She might be standing still and then arch her back and jump straight up. Such a funny bunny. She has this habit where she jumps in the tub and chews at the little mechanism that you flip up to take a bath or flip it down to drain it. I can’t figure out why she’d chew on that. It’s so hard I’m afraid she’ll harm her teeth. 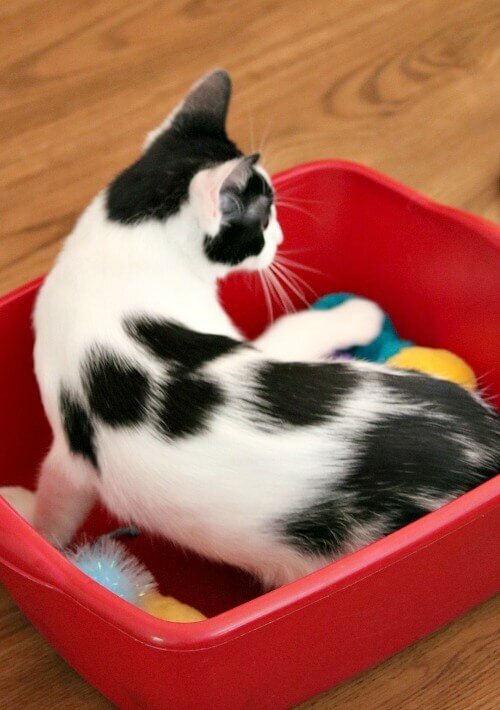 This is her ever growing toy box. Charlie with Ivy behind him playing with a toy. Right now Ivy is sleeping on the pet bed and Charlie has his head laid on it as he gazes out the front door. Tomorrow morning I take Charlie for his grooming so I’m not sure what time I’ll get a post out. I might head to the grocery store after I drop him off. I thought I really needed some lighter furniture to balance out the dark brown in the living room, which is so close to it. Ivy Lou! Just perfect! Charlie looks so much happier! Love the new table and chairs! 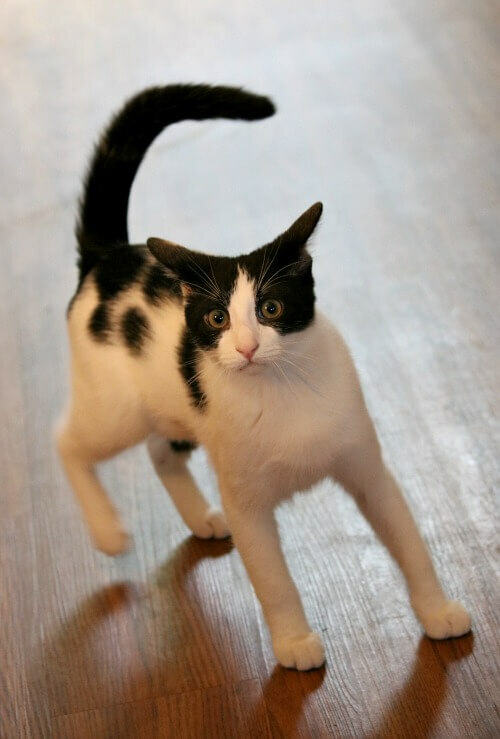 The scardy cat photo is so funny/cute/adorable! Ivy Lou comes out of your mouth easily. So when she’s into something, I can say “Ivy Lou, get out of there” and it just feels right. It is Ashley furniture I bought at Sunshine Furniture. Sunshine has more Ashley furniture than all three Ashley stores in Tulsa. Sunshine, however, is a local store. But I know you could find this at Ashley. Just don’t know the price. I paid $449 after tax. Have a great day Brenda! She surely keeps us entertained around her. Charlie just stands or sits and stares at her. Ivy Lou and Charlie are so sweet together! I too love the photo of her spooked. The dining table is beautiful! It think it looks beautiful in your house and make a wonderful addition to your comfy space. I hope the three of you have a great Sunday! I thought it was a perfect photo for the month of Halloween! Ivy Lou is perfect! I enjoy seeing her pics. & hearing about her antics. I know Charlie has no time to be bored with Ivy around. Your dining set looks very nice & love the canvases you hung above it! As for the yellow caninet, I love the sunny yellow color. An interior designer in one of my magazines says that every room needs something yellow in it, even if it’s just a bowl of lemons or a bar of soap. That stuck with me; maybe because I love yellow! I actually like the yellow myself. So I think I’ll just keep it that way. Thanks for the tip! Good looking table/chairs! Fits the space so nicely and you have such a great view of your patio sitting at the table. The paintings look so pretty on the wall above the table. I know you will enjoy many meals at this table with your daughter/grandson. Love the photos of the two of them. Ivy would be hard to keep up with; I get tired just reading about all of her antics! My cat’s latest favorite toy is a piece of mulch — he throws in in the air, he sends it flying across the patio, etc. Cats are strange but entertaining companions. That last photo is such a cute picture of Charlie. He looks so alert and sweet ( ya just gotta love that tongue). Take care and have a great Sunday afternoon. It is so strange the things that attract cats. She’s decided she likes the toilet paper and unrolling it. No surprise there. Your new table and chairs look great and fit very well with your decor. Love the art too. Your apartment is so sweet! I’m always thinking that I see the “primitive” side of Ivy that would have been in the jungle, the way she slinks around and pounces. Hm, I hadn’t thought of that. Thanks for telling me! Good color for the new dining set. 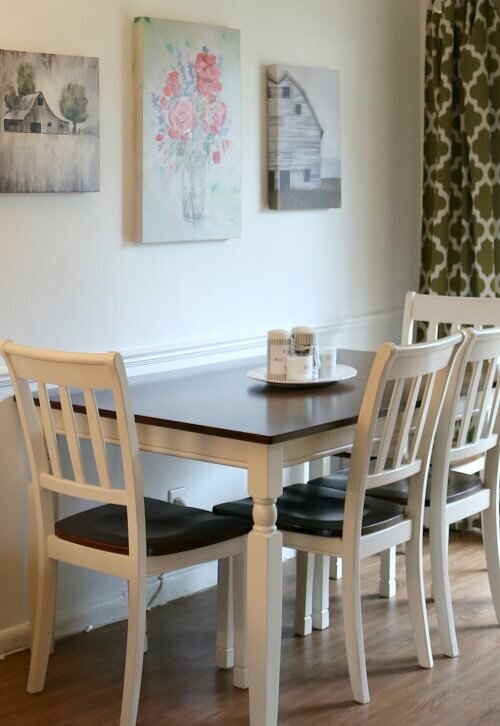 The chairs look especially comfy, and I love the contrast between their dark seats and the creamy white paint color of the rest of the chair and the dark table top contrast as well. The size is perfect for the room. Scale is so important in smaller spaces! I had measured and measured and knew that I needed a 48-60 inch rectangular size. That I couldn’t go beyond 60 inches. I knew I would put it against the wall because of the small size of the room. Love the dining set. Ivy is so funny and she seems to have found her forever home with you and Charlie. I’m happy for the three of you. Enjoy your Sunday and I look forward to seeing photos of Charlie after he gets groomed. I am looking forward to seeing Charlie after he’s groomed too! He’s looking a bit scroungy and he’s tracking dirt in. I had to wait until we got that cyst cut off, and they did that last Monday. I really like your new table and chairs and I love the canvas paintings. Ivy Lou loves your stack of quilts as much as I do. I always like seeing them. I too vote to keep the yellow. I think it is more calming. The yellow certainly matches the painting over it better. There’s no blue in it. I’m so glad Ivy and Charlie get along . And Ivy makes the place more lively . It’s been a bit frustrating here . Two weeks ago Ollie the mini poodle had 4 teeth pulled. And last week Hootie the white dog had a cleaning . So things are a bit better now . Ollie has been put on Prozac because he has so much anxiety when I’m gone . It will take about a month to get in his system before we see noticeable results. Other wise every time I leave the house I come home to some kind of mess. I haven’t come home to a mess since Ivy arrived. Well, unless Ivy made the mess, that is! I agree your dining set is very nice. I have a round glass top because glass is supposed to make a small space look more open and airy, at least that’s what I have read, but I often wish that I had a wood table. I think the contrast of the white and dark wood top is perfect. The white makes the space look more open and the wood top gives it some warmth. I think the yellow on your hutch blends nicely with the wood tones, rather than blue. If you ever wonder what you should do about something, and I’m speaking about decorating, your readers can definitely offer you a variety of opinions to think about! Ivy most definitely looks like a spooked Halloween cat. You just have to wonder what she is reacting to. She has an abundance of personality to say the least! After reading the comments, I think I’m just going to keep it yellow. I don’t want to think about painting. I’m a sloppy painter and Ivy is very unpredictable! Love your new table and chairs! I think Ivy Lou is a perfect name. I had to laugh that you call her Ivy Lou when she is misbehaving. That’s the only time my mother ever used my middle name! Looks like Ivy is protecting her toys! Ivy Lou just sounded right. She loves her toys. 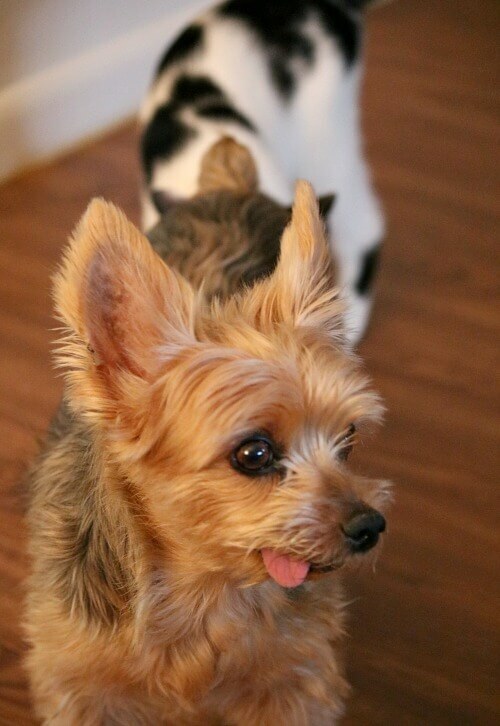 Love everything you showed today – but the pic of Charlie with his lil tongue hangin’ out? PRICELESS! Charlie and that tongue. I have grown used to it. But when people who don’t know him see him, I always feel that I have to explain that he only has two teeth. I don’t want someone to think anything’s wrong with my Charlie boy! Hi love your table set and your apt. You have good taste. Your pets are so cute too. Have a good day. I hope to inspire people living in small spaces that they can live big. So fortunate that Ivy & Charlie get along so nicely. Great middle name and dining set. I love your pet stories and photos! That’s good, because I am full of pet stories and pet photos. I LOVE your dining room set ! It seems to be a perfect fit and it will be so much better when your family is over. 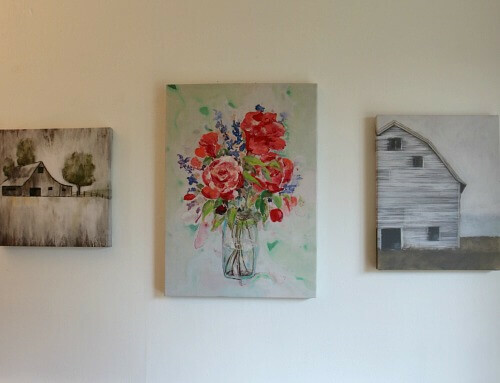 Your paintings look wonderful over it, I especially love the floral one ! I just changed my kitchen around a bit, which is something I love to do. Like you, I love to decorate and use what I have and change things up from time to time. Ivy Lou is such a cutie and I can’t get enough of the pictures of her and Charlie ! I give my cats middle names too and nicknames ! I thought Ivy was enough because I couldn’t come up with a middle name that “fit.” Lou fit. I like Ivy’s middle name. It’s fun to give them the complete works when it comes to a name. Our female cat that passed away this summer was named Harriet Louise Hatfield and we called her Hattie Lou. Her brother’s name was Mickle Pickle McCoy. We usually just called him Mickey. My husband is descended from the infamous Hatfields of the Hatfield/McCoy feuds, hence the names for the cats. I just realized that we have not given our new cat, Calvin, a full name. This will take some deliberation. Have a great afternoon. Please let us all know what you come up with. They deserve the full treatment when it comes to names. I love the name Hattie Lou! I really like your new table and chairs. They are just the right size for that area. You made a grade choice. Love seeing the pictures of Ivy Lou (and I like this middle name) and Charlie. They always put a smile on my face. They keep a smile on my face. I love your table and chairs it looks perfect in that space. Little Ivy Lou is a cute full name too. Have a great rest of the day and enjoy the new week ahead. I loved having a small table. But it just wasn’t big enough when I had family over. oh my! there is nothing to add. Ivy Lou and Charlie Ross couldn’t be cuter. can’t wait to see Charlie after his hair cut! he seems to not be dreading having his picture taken anymore. I’m glad because he’s so photogenic! and Ivy is the best little clown around! LOL. 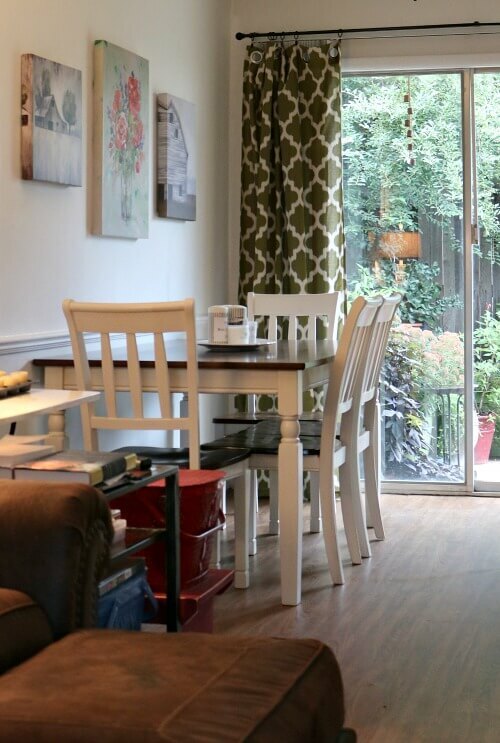 and speaking of photogenic… that table and chairs are perfect! they look comfortable and so neat. as if the spot had just been waiting for them! My Ivy Lou and Charlie Ross, how I love them! I love the new table and chairs! It looks so pretty and is definitely a good balance with your living room furniture. I agree, you definitely do not want an Ivy paint debacle going on…that would be a nightmare and you would have a blue cat! That photo you took tickles me also…cats are so funny! I’ve heard that aluminum foil is good at training animals to keep them from jumping on furniture. You put the aluminum foil where you don’t want them to jump and when they jump on it, it scares them so they get down. I don’t know though, we don’t have any animals. Have a great one! Tried that. She didn’t appear to be afraid of aluminum foil. Or sprays of water in her face. Ivy is fearless. Your kitty is adorable! I love your dining room too. I so desperately want a new dining room table and was all set to get one when I realized I should probably wait until the puppy is safely out of the furniture chewing stage! Love, love your new dining table and chairs, and also how you have arranged the art. My friend has two kitties who are constantly getting into trouble. She uses a spray bottle filled with water and squirts them to keep them in line. It works temporarily and they.soon return to their antics. Ivy Lou and Charlie are adorable together! The new table and chairs is perfect! Good choice for Ivy’s middle name…love to see the picture of Ivy and Charlie together. I’m going to chime in with the rest of the comments here: l love the new table and chairs. And I actually love the yellow and blue furniture – they look very nice and colorful. And I love that Spooky Kitty pic of Ivy Lou – too funny! Brenda, how nice that now you have a big enough dining table to have your family for a sit-down meal. It’s a cute little set–big enough with a light feel. And comfortable chairs. It might be hard to get up and leave the table when you finish the meal! Well, you certainly don’t lack for entertainment lately. Kittens can be so crazy. It’s been ages since I’ve been around a kitten. I do remember some of the antics of the ones we had when I lived at home. The two geriatric lady felines that live with me now are quite sedate but sometimes the older one, Rhoda, gets a little frisky. Her favorite place to sleep–which she does a lot of–is on the floor in front of the refrigerator because it puts out warm air when it runs and she likes that. So I keep a little rug there for her to lay on. The other old lady is Talula and she is so skitterish that she’s always racing under something or down the stairs to the basement. She startles at the slightest sound sometimes. And to top it off, she and Rhoda do not get along at all. They tolerate each other but barely. They don’t fight but they “have words” fairly frequently. You “Halloween” cat is funny–Ivy Lou looks like she’s really been spooked. Our Talula is all black with beautiful long fur. I would like to capture a picture of her with a pumpkin but it would be hard. I’d be ready to shoot and she would probably be spooked by something and run away! So glad you’re enjoying your new baby. And that Charlie seems to be happy to have her around. Hope your weekend was pleasant and low key. 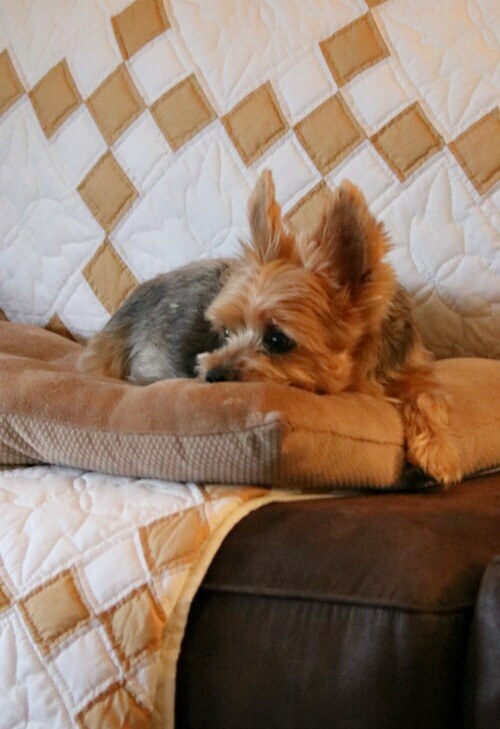 I’ll look forward to seeing Charlie in his new “dapper” hair cut and to hearing more about the adventures of Ivy Lou. Pats for the four-leggeds! Love your dining table and chairs and love the art above as well. Ivy Lou is such a character and Charlie seems amused or bemused by her. Love the way you fix your nest and make a home for your babies . Wow! Beautiful! I am highly impressed on your blog. Thank you for this informative blog. Your new table is perfect and I think the cabinet would be pretty painted blue. I love the new table, Brenda!! It’s just perfect in your cozy home! Oh that little Ivy Lou, she just cracks me up!! Love your new table and chairs — and it looks like a perfect fit. Ivy looks like so much fun — glad you decided to get her. Have always loved your unique colorful decor … especially the pops of red. So cheerful and happy. Are you now converting to a farmhouse decorating theme? Your new table set is very pretty and I’ve noticed you’re selecting more neutrals colors. 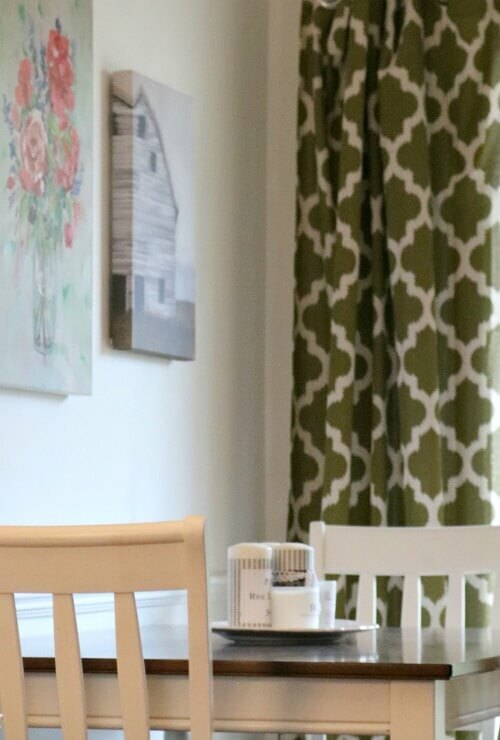 The new dining room set looks great, but not nearly as cute as Ivy does!